This fly is one I have devised after getting some dark green straggle fritz and struggling to find something to do with it. In past years I have had some success with snails which I have tied using black plastazote foam. I know that some waters do well with terrestrial insects and beetles blown on the water. I have not come across a convincing pattern for a water beetle, which I know do get taken by trout. The braid under body imitates the air bubble and the straggle fritz makes the legs when the overbody is pulled over. Leave enough foam after tying off to imitate the head. This pattern should be fished on a sinking line with a short leader and long slow retrieves. Tie a couple up and give them a try and let me know if you have any success. Hook – Long shank light weight size10 (Kamasan 830). Underbody – Orange/white Diamond Braid / Parton Body Czech. 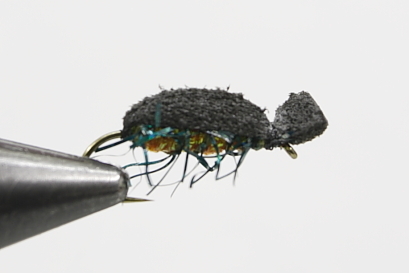 Hackle – Black/Dark Green Straggle Fritz in open turns..
Overbody – Strip Black Plasazote 3-4 mm. Square. Excellent, simple no frills instruction which was so easy to follow, with the end product resulting in three double figure fish in three sucsessive casts from my local water ( Bessy Beck, Cumbria ). So thank you, and tight lines. I would like to start by saying your YouTube videos thought me how to tie Flys. For that I’d like to say thank you. I live in eastern Canada. A place called Dartmouth, Nova Scotia. Also called the city of lakes. I started using this water beatle and didn’t have much luck until the late season then it became a secret weapon. Everyone wanted one so I thought others how but I told them it was called The Cammiss Beatle. That is now a common name around here for fly fishermen. I’ve seen some new variations but most use your pattern. I just want to let you know that’s the name I gave it here and it stuck. So be proud. It works awesome on warm calm days expecially late in the season. P.S. I always call it varnish and always use a double half hitch at the end. God speed and again thank you good sir. that a cool looking fly, I’m only a beginner so I’ve still got stuff to buy .When I do get some equipment I’ll try making this fly. Hello! I tried to tie the beetle pattern and I used a peacock sword tip to make the legs. It produced excellent legs that are stiff enough to stand off the hook and hairy looking. I have not tried them yet but they are very convincing looking bettles. I dropped it in the water and the stiff legs make the water surface tension bend a little to give that icky beetle bug motion. I used orange yarn too under black foam to cover a pipe. It is very smooth foam too when tightened. Same process. I also have made my own green darner pattern. These lessons have helped much, and I get better with every pattern. It reminds me of doing the art at college where you simply do one bit at a time with good craftsmanship. Very clear instruction! I have greatly enjoyed all of your videos, I found your website as I decided to start fly fishing, and learning how to tie flies so easily from your videos greatly encouraged me to get into the sport. Your flies look so realistic and you do a great job at showing people how to tie them, such a good job that a novice such as my self have had no problem replicating these flies with great ease. very good. I want connext to you. I’m new to fly fishing and new to fly tying, but I’ve been already caught by the magic of it! i am 11 years old and my dad got me to watch you tie the water beetle. We went fishing last saturdat and i caught my first fish on my new flyrod. i tied this fly right before we left and it works thank you for teaching me this fly. Crappie. I like the legs and body on this Jig. Again your video’s are Great. ps: I just wish I could have found you site 10 years ago.